Katarina Isaksson, “Column,” Art Oneida, accessed April 20, 2019, http://artoneida.org/art/items/show/139. Description: Katrina Isaksson was born in Göteborg, Sweden in 1957 and educated in the U.S. receiving her MFA from Hunter College in New York City.She exhibits frequently in New York and her work has been reviewed in The New York Times, Sculpture Magazine and the Observer-Dispatch.Today she teaches art at Hunter College in New York City, helps her family run their organic farm in Franklin, NY and, most importantly,continues to make her art. 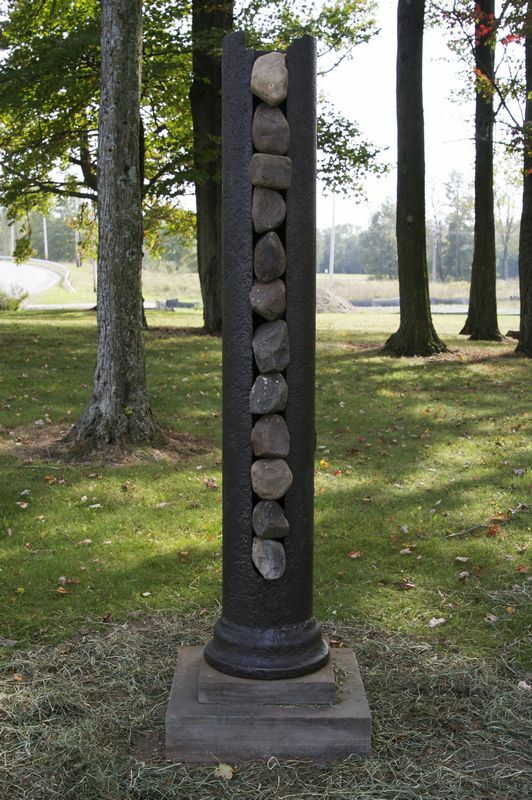 Column was completed in 2000 as an outdoor piece for the Commons in Ithaca, NY. It plays on and makes references to both urban and natural structures as well as Classical history. It is most fitting that it was seen first in Ithaca and is now resited in Rome. Her Sculpture Space residency in 1987 was an invaluable experience for Isaksson. As she remembers, "With the funding, space, and time, it made it possible for me to realize a critical piece. It was a fantastic time with wonderful people."